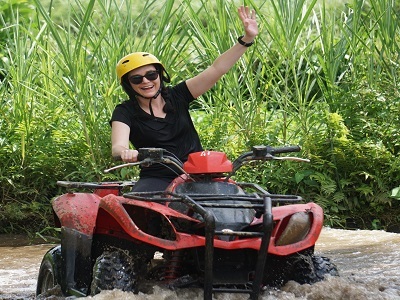 Bali Cycling, Elephant and ATV Ride Tour is an Bali Triple Activities Tour Packages we created for you to enjoy the funtastic kintamani cycling tour, riding an eleohants for 30 minutes and ride the ATV bike for 2 hours during your jurney explore this amazing islands. Exercise and Education is the motto of the Cycling Tour, in here you will learn about the unique culture of Balinese people and the history of the site will be visit, before start to paddle your bike from Kintamani, you will be having light breakfast overlooking the amazing view Mount Batur Volcano view and then your start your 2 hours adventure to paddle your bike from downhill kintamani road. At the finish point you will be enjoy the delicious lunch Indonesian food. After finish the lunch we will driver to the elephant parks for enjoy the 30 minutes journey to explore the parks and see the amazing view of jungle. Then after finish the ride you will enjoy the 2 hours ATV Ride tour packages we offer by exploring the amazing view of jungle, try to beat the beaten track we made for your joy and visit come local village to see the unique daily social activities life. Then after finish the ATV we will drop you back to your hotel for take rest after do some tired adventure. This Bali Cycling, Elephant and ATV Ride Tour Packages is more memorable one by assist with our Best Bali Driver and the Private Car.